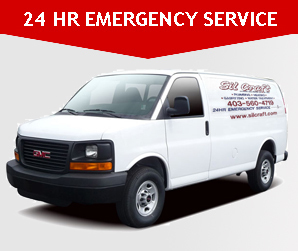 We are here for you 24/7/365 when your plumbing and heating systems aren’t! Don’t hesitate to call us morning, noon, or night. From demolition to completion, SilCraft has the elite when it comes to the tradesmen you’ll need for your complete custom Kitchen and Bathroom! We have a group of professionals that are hand-picked and the best at what they do, whether it be Custom Cabinetry, High End Plumbing Fixtures, or Flawless Tile Setting, we’ve got the know-how to make your dreams a reality. Ask about a free consult if you’re thinking about renovating your kitchen or bathroom today! We’ve got a full line of quality fixtures that include Toilets, Sinks, Custom Showers, Roman Tub Fillers, Pressure Balanced Shower Valves (with a variety of trim packages), Taps (single or two handle), Under mount sinks, Garburators, and Kitchen Faucets. High efficiency is the way of the future. With our 96% efficient Series Furnaces, you’re sure to not only save on your heating costs, but get rid of those cold spots or rooms in your home as well. Whether it’s for your new home, or a retrofit to replace an existing one, we’ve got the furnace that will best suit you and your family’s needs. Do you have low hot water pressure or a lack of hot water all together? The solution isn’t always to replace the heater. We are dedicated to getting the most life out your water heater possible. Give us a call and we’ll come take a look, free of charge! High Efficiency Boilers and In-slab heating are becoming not only a more comfortable approach to heating your home, but also more cost effective! It’s no secret that Calgary has a very dry climate. If you suffer from seasonal allergies or all year round allergies, we can help! We may not be able to do anything about the weather, but we sure can make your home more comfortable to live in. Soft water solutions are a must as Calgary has some of the hardest water in North America! Concerned about the chlorine or other chemicals in the drinking water? We have all the necessary equipment needed to combat these issues. SilCraft is able to meet any and all needs when it comes to gas fitting with the proper expertise and permitting required. This includes all Residential, Commercial, or Industrial applications or upgrades to existing services.